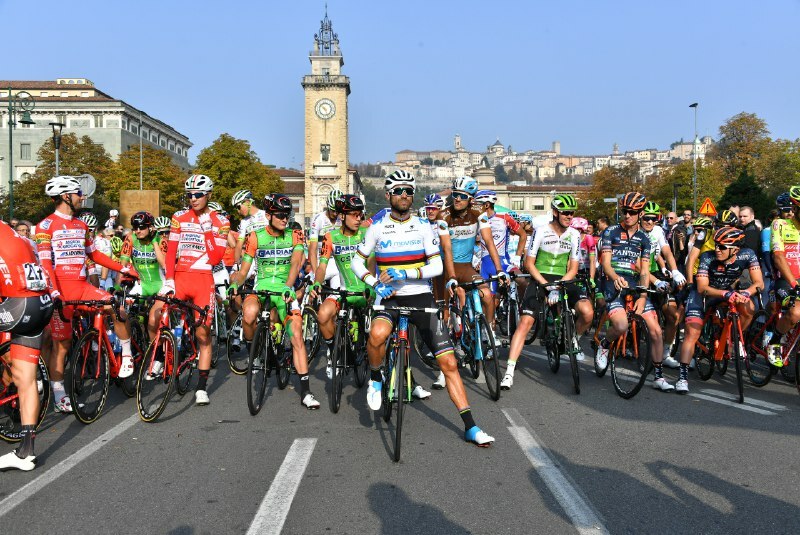 The 112th Il Lombardia NamedSport, the fabled ‘Race of the Falling Leaves’ organised by RCS Sport/La Gazzetta dello Sport, which constitutes the fifth and last of the great one-day monuments of the season. The beautiful, challenging route, featuring 4,000m of total elevation, culminates with a final section that places a series of steep climbs – starting with the classic Madonna del Ghisallo – between the riders and final victory. The race will be a “revenge” race for the last edition of the World Championships, with the entire Innsbruck-Tirol podium in the entry list. Lining up next to Alejandro Valverde, Romain Bardet and Michael Woods are the other riders set to challenge last edition’s winner, Vincenzo Nibali. Among them are Gianni Moscon, Thibaut Pinot, Adam Yates, Enric Mas, Rigoberto Uran, Tim Wellens, Primoz Roglic, Rui Costa, Wilco Kelderman and Bauke Mollema. The peloton, 168 riders strong, passed km 0 at 10:32. The race sets off from Bergamo, southbound. The route initially leads through the Bergamo plain (over the first 40km), and then up along the Val Cavallina, all the way to Casazza, to tackle the first climb of this race: Colle Gallo (763m). A fast descent leads back from Val Seriana to Bergamo; here the route goes back on flat roads and eventually arrives in Brianza. The course passes briefly across Colle Brianza (533m) and descends into Pescate, then heads for Valmadrera and Oggiono. Finally, it rolls past Pusiano and Asso, and then descends into Onno, heading for Bellagio, where the Ghisallo climb (754m) begins. The ascent has a maximum 14% gradient, on a wide road, with several hairpins. The descent runs quickly on long, straight stretches up to Maglio, where the Colma di Sormano climb (1,124m) begins abruptly after a right-hand bend. After some kilometres with moderate gradients, a few hundred metres past Sormano, the route turns left to tackle the Muro di Sormano (2km at a 15% gradient). The road is tight and very steep, and it runs partly through the woods, with very narrow hairpins and sharp gradients exceeding 25% and reaching almost 30% after about 1,000 metres. After clearing the Colma, the road climbs down into Nesso (initially a false-flat drag, followed by a very technical descent with several hairpins on a narrowed roadway). Here, the route takes the coastal road that leads to Como. A harsh climb up to Civiglio follows (614m), with steady 10% gradients; the route then drops down, runs through Como again, and heads for a last, short climb starting in San Fermo della Battaglia. Two fixed Feed zones are provided: the first in San Sosimo (km 92-95) and the second in Onno (km 163-166). The last 10km begin in urban Como and run along wide avenues, up to the railway underpass, where the short, final climb begins (approx 1,500m, with an average 5% gradient). The -3km mark is set at the roundabout in Largo Ceresio. The final descent, leading all the way to Lungo Lario, runs along a wide and well-paved road, with two well-lit tunnels and two wide roundabouts, and ends 1,000m before the finish. One last, wide left-hand bend is found 600m before the finish. The home straight is on a 7m wide asphalt road. Also known as the “City of the Thousand”, after the many volunteer soldiers who fought under Garibaldi for the unification of Italy in the mid 19th century, Bergamo is divided into Bergamo Alta and Bergamo Bassa – upper and lower Bergamo. Bergamo Alta is one of the few towns in Italy whose centre is still entirely surrounded by walls. A number of characters of Italian Commedia dell’Arte – a variety of improvised comedy based on stock characters, some of whom also appear in British Punch and Judy – are native to this area, too, including the comic servant Arlecchino – Harlequin, in English – with his typical green and red smock, and the labourer Gioppino. The birthplace of the artist Caravaggio (1571-1610), the composer Gaetano Donizetti (1797–1848), the aviator Antonio Locatelli (1895-1936, the first to cross the Andes at their highest point), the voice artist Renato Cortesi (b. 1939), the Italian voice of the actors Jeff Bridges, Gérard Depardieu, William Hurt and Liam Neeson, Bergamo is also the home of the former cyclist Felice Gimondi, winner of the Tour de France, Giro d’Italia, Vuelta a Espana, World Championship, Paris-Roubaix, Milano-Sanremo… and Il Lombardia NamedSport (in 1966 and 1973, the latter, wearing the rainbow jersey of the World Champion). The Santuario del Colle Gallo dates to 1690 when a pilgrim had a vision of the Virgin Mary. Like the Madonna del Ghisallo, the Madonna del Colle Gallo has been elected the patroness of cyclists and, since its renovation in 1990, the Sanctuary has become a popular cyclists’ meeting point. According to the legend, the medieval count Ghisallo was saved from bandits by the Virgin Mary, and the Madonna del Ghisallo subsequently became the patroness of local travellers. When the climb up to Madonna del Ghisallo became part of the route of Il Lombardia NamedSport, a local priest, Father Ermelindo Viganó, proposed that the Madonna be declared the patroness of cyclists. This was confirmed by Pope Pius XII. The shrine of Madonna del Ghisallo contains a small cycling museum with photos and artifacts from the sport. There also burns an eternal flame for cyclists who have died. The “Muro di Sormano”, also referred to as “the world’s toughest cycle path” by cycling enthusiasts, is one of the iconic and most famous climbs of Il Lombardia NamedSport, along with the “Madonna del Ghisallo”. It was first included in the route back in the 1960s to make the race even more challenging, but was then dismissed, only to make its comeback in 2006 after the old road surface was replaced with a new tarmac layer. The climb is as spectacular as it is challenging, for its incredibly steep gradients. Each metre is numbered, and elevation is marked to provide riders with consistent reference points as they make their way to the top, between two wings of spectators. Birthplace of Pliny the Elder, author, natural philosopher, and naval and army commander of the early Roman Empire, who perished during the eruption of Vesuvius in 79 AD, and his nephew Pliny the Younger, author and magistrate. The physicist Alessandro Volta (1745-1827), who gave his name to the unit for electric potential difference (voltage), was also born in Como. The Rockefeller fountain now in the Bronx Zoo in New York City once stood in Como’s Piazza Cavour, where this morning’s roll out began. The fountain was bought by William Rockefeller in 1902 for 3,500 lire (the estimated equivalent then of US$637).